This 2017 Ford Fusion Titanium is offered to you for sale by Toyota of Warsaw. This Ford includes: ENGINE: 2.0L ECOBOOST (STD) 4 Cylinder Engine Gasoline Fuel Turbocharged FUSION TITANIUM DRIVER ASSIST PACKAGE Variable Speed Intermittent Wipers Remote Engine Start Smart Device Integration Lane Departure Warning Lane Keeping Assist Heated Steering Wheel Intermittent Wipers Blind Spot Monitor Cross-Traffic Alert Rain Sensing Wipers INGOT SILVER ALL-WEATHER FRONT Floor Mats MEDIUM SOFT CERAMIC, LEATHER HEATED SPORT BUCKET SEATS Seat Memory Power Passenger Seat Power Driver Seat Heated Front Seat(s) Passenger Adjustable Lumbar Leather Seats Driver Adjustable Lumbar Bucket Seats 50-STATE EMISSIONS SYSTEM TRANSMISSION: 6 SPEED AUTOMATIC W/PADDLE SHIFTERS Transmission w/Dual Shift Mode A/T 6-Speed A/T TIRES: P235/40R19 PERFORMANCE Tires - Front Performance Tires - Rear Performance *Note - For third party subscriptions or services, please contact the dealer for more information. * This 2017 Ford Fusion comes with a CARFAX Buyback Guarantee, which means you can buy with certainty. 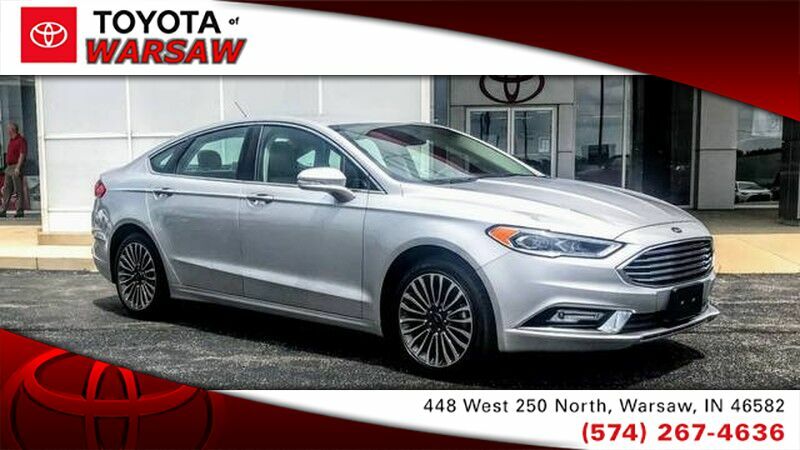 With its full CARFAX one-owner history report, you'll know exactly what you are getting with this well-kept Ford Fusion. If you are looking for a vehicle with great styling, options and incredible fuel economy, look no further than this quality automobile. Marked by excellent quality and features with unmistakable refined leather interior that added value and class to the Ford Fusion The interior of this Ford Fusion Titanium has been through meticulous inspection and could almost pass for a brand new vehicle. Treat yourself to a Ford Fusion that's got it all. Nearly every option is packed into this beautiful ride. More information about the 2017 Ford Fusion: The Ford Fusion is a mid-sized sedan and must therefore compete in an incredibly competitive segment. On the other end of the price spectrum, the Fusion Platinum is outfitted with a variety of luxury equipment, providing a sensible alternative to the entry-level cars sold by several luxury marques. And in the new Fusion Sport, a 325-horsepower turbocharged V6 provides plenty of punch for those looking to cruise in the fast lane. Strengths of this model include stylish, practical, available turbocharged V6, available plug-in hybrid drivetrain, available all-wheel drive, and Efficient. Competes with the Honda Accord, Toyota Camry, and many others.